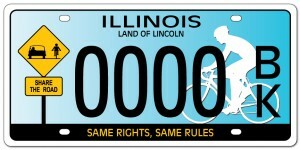 Now available to Illinois motorists Bicycle Plates – buy yours today! It can be with a Major credit card or Paypal. It cost me $10 a month to keep this website active. Would you consider sponsoring one or two months?